Remove husk from tomatillos and rinse well; slice. In a large bowl, combine tomatillos, sliced onion, diced bell peppers and sliced serrano chile; set aside. In a large saucepan mix vinegar, sugar, coriander seeds, peppercorns and fennel seeds, and bring to a boil. Pack tomatillo mixture into hot, clean pint jars leaving one inch headspace. Carefully ladle hot seasoned vinegar mixture over vegetables leaving 1/2-inch headspace. Carefully remove air bubbles, wipe rim clean and adjust lids. 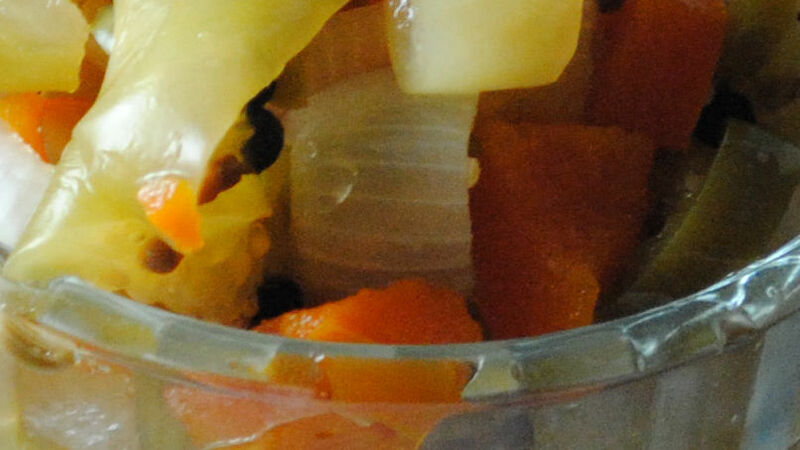 Process jars in boiling water canner for 15 minutes; carefully remove jars and allow to cool completely. If you are worried about heat, simply remove the seeds from the chili pepper for less spiciness. Looking for a yummy way to use up all of summer’s bounty? Why not try canning a few pounds of these bright green tomatillos. Canning ensures you can enjoy your garden’s best throughout the year. These spicy tomatillos go great over pork or fish and are great used to top that favorite sandwich.